« The Picture Says A Lot! We know our readers will be happy to help! or a military family member here or abroad. are on the link provided. 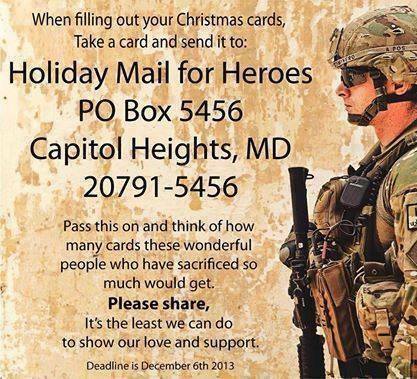 believe in the wars, please send a card. This entry was posted on November 20, 2013 at 5:11 am and is filed under American Military, Death, Gratitude, Holidays, Soldiers, WAR. You can follow any responses to this entry through the RSS 2.0 feed. You can leave a response, or trackback from your own site. I’ve taken down the address and will be sure to get some out shortly. Terrific post, Thanks, CJ. I sent Christmas parcels to the Australian troops last year. I still don’t know if they ever received them though. This goes through the American Red Cross, I believe. I am positive that they got there, Suz. Mine went through the ADF (Australian Defence Force). More than likely they got there. I just never heard anything back although I enclosed my email address in the parcel.